As telescopes of ever-greater power scan the cosmos looking for life, knowing where to look—and where not to waste time looking—will be of great value. The magnitude of the chaos can range widely, Barnes said, from planets whose orbits remain largely circular to those "whose orbits get so elongated that a planet could slam into its host star—an extreme form of climate change!" Even if the effect isn't that dramatic, the orbit—thus the climate, as orbit is a primary driver of climate—could still be severe enough to inhibit life, or sterilize the planet if life has already begun, Barnes said. The particular effect they studied is called a "mean motion resonance" and it comes into play when two planets' orbital periods are an integer ratio of each other, such as Neptune orbiting the sun three times for every time Pluto orbits twice. A repetitive force, like a gravitational nudge, happens at the same place in the planets' orbits around the star, the effect of which grows slowly over millions of years. This can happen to a planet in its star's habitable zone, the swath of space around it that's just right to allow an orbiting rocky planet to have water in liquid form on its surface, thus giving life a chance. Barnes calls such worlds "chaotic Earths" and suggests making them lower priorities in the search for life. Another condition for this orbital bullying is "mutual inclination," meaning that the two planets are angled toward each other in space. Planets in our solar system all lie along the same plane in space, and are called coplanar, but not all planetary systems are like that. So Barnes and colleagues decided to "kick up" inclinations between planets in computer models and study the result. "That was the basic idea," he said. "What happens when you have planets that are in this resonance and with mutual inclinations? "And what we found was that things go all haywire. Those little perturbations that keep happening at the same point cause one of the orbits to do some crazy things—even flip over entirely—and then kind of come back to where it was before. It was pretty unexpected for us." 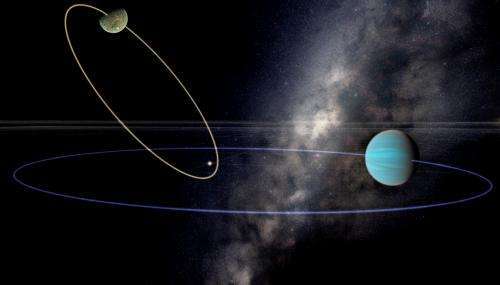 "Planets in systems that drive orbits to near-misses with the host stars are less promising targets and should be skipped over for other candidates," Barnes said, "even if they are found today on circular orbits in the habitable zone." "Some habitable exoplanets could experience wildly unpredictable climates"
But that is what Mars is; its orbit is unstable due to a lack of our Moon. Isnt the reason we are there to see if life could actually adjust to a chaotic world?